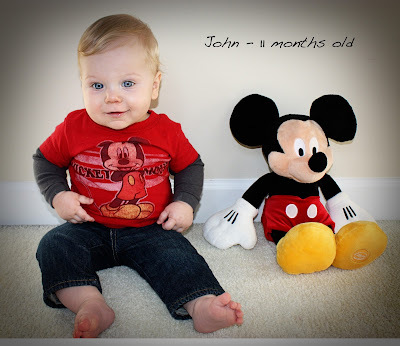 Oh my word.. John was eleven months old yesterday. Justin reminded me that in one month he will be a year old and thus the monthly picture with Mickey will end. We joked about having him take a picture with Mickey each year (even his teen age years). I don't think John will go for that, but it would be funny if 18 years from now.. I was showing you his picture with Mickey (one can only dream). I seriously can't believe how quickly it has flown by. He is getting so big. He is crawling everywhere and so curious. He studies how things work. I would love to know what is going on in his little mind. Here is his eleven month picture.